Precipitation Measurement Missions | An international partnership to understand precipitation and its impact on humankind. An El Niño that began to form last fall has matured and is now fully entrenched across the Pacific. Changes in sea surface temperatures or SSTs brought about by an El Niño affect the atmosphere, resulting in distinctive changes in the rainfall pattern across the Pacific Basin. These changes show up as anomalies or deviations in NASA’s analysis of climatological rainfall. 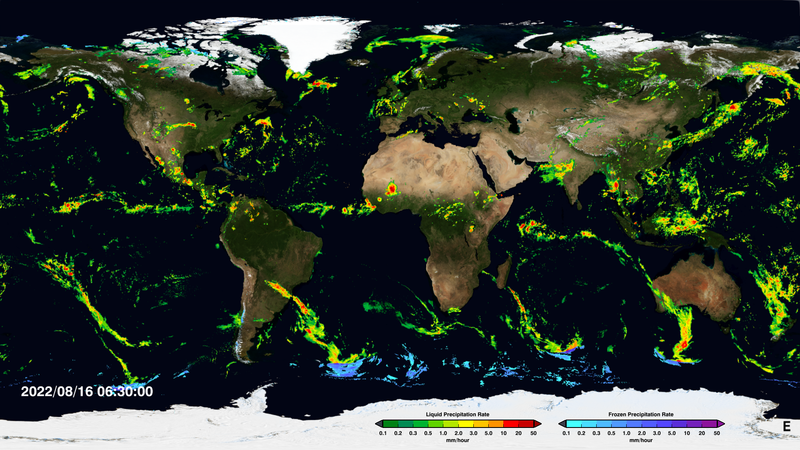 Precipitation data from the GPM and TRMM missions is made available free to the public in a variety of formats from several sources. This section outlines the different types of data available, the levels of processing, the sources to download the data, and some helpful tips for utilizing precipitation data in your research. Learn how to access and analyze global precipitation data in this series of training sessions. Register for upcoming training sessions and download videos and slides from past training sessions. Topics include: Overview of GPM data and tools, GPM data search and analysis, data import and analysis in GIS, using Python with GPM data, and more. Photos and videos that tell the story of the Precipitation Measurement Missions. Watch the GPM Core Observatory being built and tested at NASA Goddard, learn about the science of measuring precipitation, and more. Through an advanced set of instruments, TRMM and GPM provide new information on precipitation characteristics and how rain and snow interact within the Earth system. This section explores how space-borne precipitation measurements are acquired, processed, and utilized.